8:30am “You’ve done your hair especially”, as he secures his bike. He is pleased, most people don’t notice. 8:30am She notes the marked cycle route with enthusiasm. 8:40am “If you wave at someone they’ll wave at you back”, as he waves at a someone on a passing boat, and they wave back. He never tires of testing this hypothesis. 8:40am A sandwich crust is lodged between an external wall and a series of small railings. We’re not hungry, happily. 8:43am City of London asset tag #946 / 003: a lamppost. A nearby lifebuoy is not considered an asset. 8:43am Yes, a lamppost. 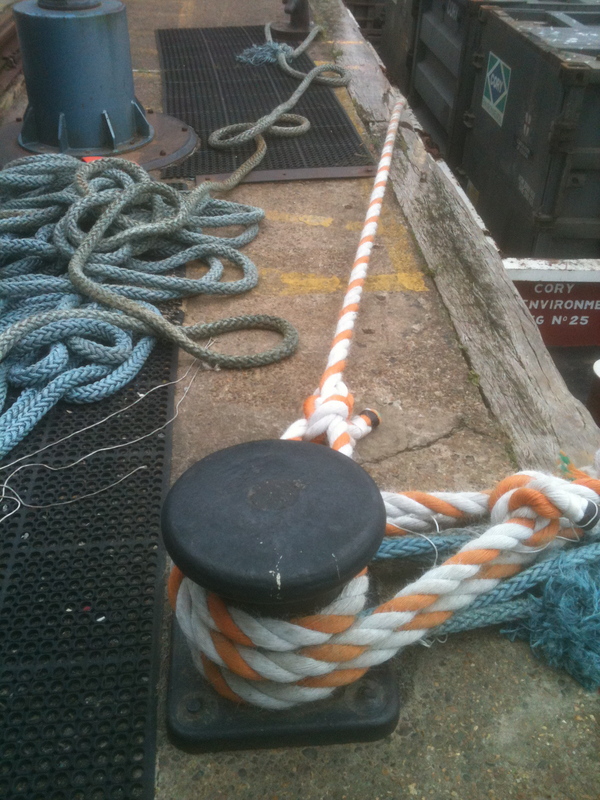 And then a taut orange and white rope, next to a loose, long blue one in a twisted spiral. 9:03am We follow the haphazard blue dotted lights through the tunnel, as a jogger runs past. 9:03am Wind turbines speedily dash through air in the distance. She thinks of fields, enchanted beauty and still summer days. 9:14am A sign warns: “LESS NOISE PLEASE Consider Offices Above”, as we continue, conscious of our chatter amongst the other single, silent, walkers. 9:14am An old livery is filled with men in blue shirts, working for the law of the land. 9:28am Returning to collect his bicycle, he sees a man with binoculars looking out across the river. 9:28am The sharp shot of swimming pool chlorine still hangs in the air. This walk and piece of writing was completed collaboratively with the fabulous Stephen Nash.